You make even the humble veggie look glamorous. Gorgeous, perfect picture, as always. I wish I could get some of that sprouting broccoli (or was that broccolini?) here in Estonia – I used to buy that often in Edinburgh (in that supermarket close to Richmond Place, you know:) Such a great, tender flavour.And I agree with evolvingtastes’ comment – you do know how to make a humble vegetable look all fancy and glamorous! 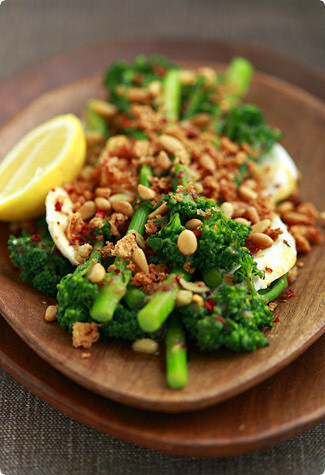 I’m not familiar with broccolini, but from the photo it looks a lot like broccoli rabe/rapini. If this is not simply an anglo-american translation issue, is broccoli rabe a good substitute?Also, I assume based on your aversion to "fishy," that the anchovies impart a nutty rather than fish-like flavor? I love broccoli and would eat it in just about every form, but this one looks particularly scrumptious. I usually steam it for just the right texture. Btw, I’ve always found it’s a very American ingredient- few other cultures eat broccoli like we do, sometimes I actually miss it when traveling abroad. Oh my goodness…broccoli is one of my favorite vegetables, but this? THIS?! Pure nirvana. Now I am just the opposite; I love broccoli, and cannot abide cauliflower. Oh, and of course I love chocolate cake. But I don’t imagine that I agree with Mr. Bush (Sr. or Jr.) on anything else. I’m not going to lie – this looks absolutely fantastic!Great picture too, by the way. This is just too beautiful to eat! But I would not hesitate either, of course. Your images inspire me to go back into the kitchen and cook something, not just to eat, but to savour! I have just stumbled upon your blog and I am so glad I did. Thank you so much for sharing. I’ve got 3 heads of brocoli growing in the garden right now. Each are about 3" in diameter. Another month to go. This morning, I whispered to head #2 that he’s gonna be used in this recipe! I love the way you write, i love the way you click your food shot and guess what, u even made me love Broccoli !!! I loved your broccoli story – I had a good laugh. Dare I say that I do not have anything that I hate eating(well maybe some of the things Anthony Bordain sends down his gullet on "A cooks tour", but my husband feels like this about tripe and oxtongues and stuff.will read him your story. So happy we found your blog and especially a new way to prepare broccoli. There’s definitely a way to eat healthy and well! Your photographs are outstanding as well. Thanks for the great meal! Your broccoli looks great definitly a step up from my usual steamed version! Hi Melissa- Can i tell you that after I read your blog I decided to start my own? Just like that! I also sent you an email and right after I said I need to do this too. I loved reading your posts about the Basque Country because that’s where I am from. Thank you for the inspiration! Nothing is better than burrata. I got some in Philadelphia a few months ago and have just managed to track it down in San Francisco. Heaven! nice photo, and it really looks good. thats a new way of cooking broccoli, thanks for a new idea.